Findhorn is a northern Scottish community deeply connected to spiritual growth through work and communal living. Back in the sixties, it was an unintended community with strong connections to devas and elementals who helped to grow the most amazing vegetables so that the founding members and their children could have food. For more information about Findhorn click here. 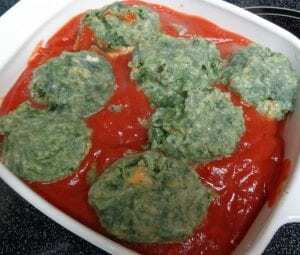 Since today is Spinach Day in North America, I thought I might share a spinach dumpling recipe from the Findhorn Family Cookbook by Kay Lynne Sherman. It is something I make reasonably often for vegetarians and when I need something halal for friends. The dumplings can be made the day before and stored in the fridge until ready to cook. Spinach is a vegetable connected to prosperity and who would not like a little extra freedom in their lives. Kay Lynne writes” One thing we notice at Findhorn is that the attitude of the cooks has a tremendous effect on the whole community. It is a pivotal job and must not be performed by someone who considers it a drudgery The same is certainly true in every home. The consciousness you bring to the job is transferred to the food and from there to your family. So cooking is really a way of giving; a daily ritual of bringing Spirit into matter.” You know what to do. Stop. Take a deep breath, come into the present moment with an open heart and begin. 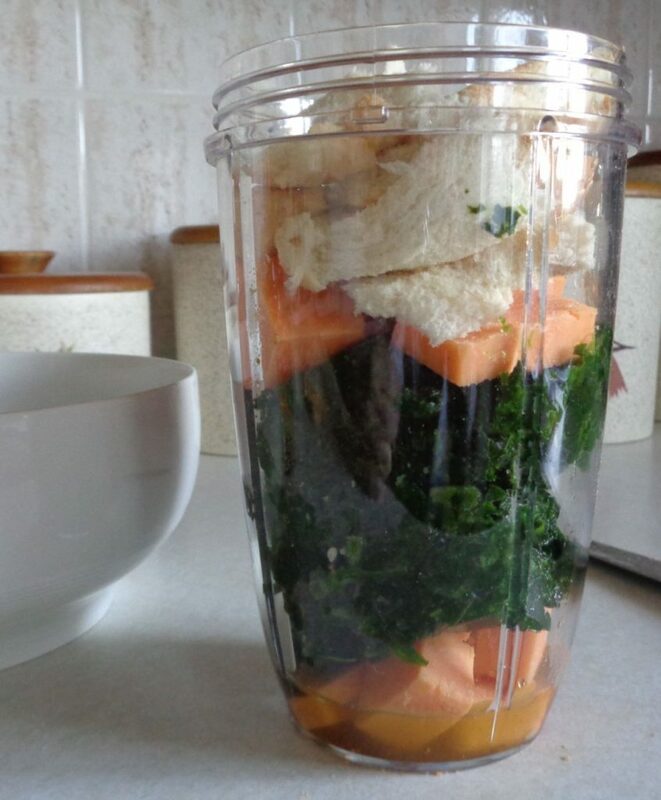 If using fresh spinach, my first choice, wash steam and drain well. Measure one cup. In a pinch frozen can also be used but be sure it is also well drained. The dumpling will be soft and getting as much moisture out at the beginning as possible helps. 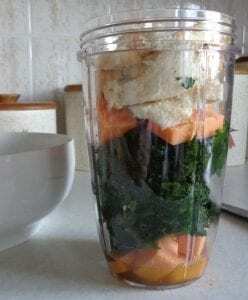 Combine the spinach, cheese and dried bread together in a blender and pulse. 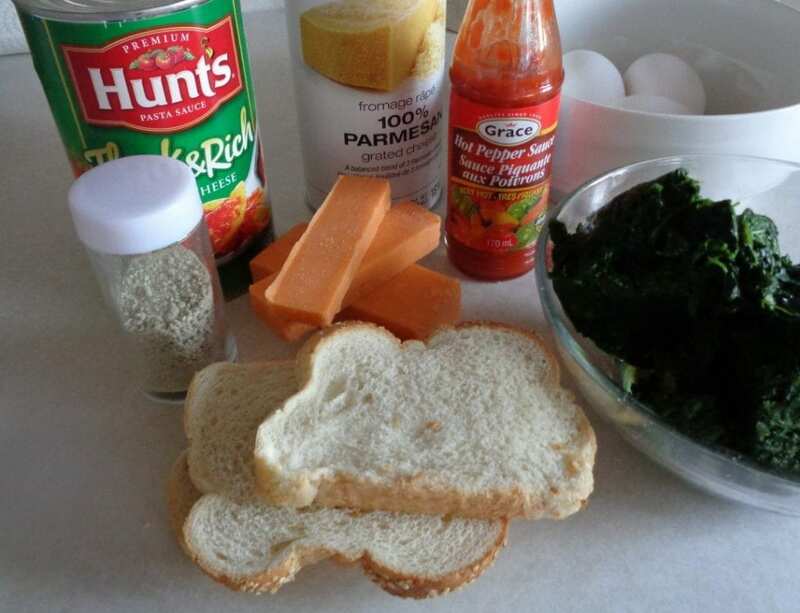 Transfer the mixture to a bowl and add eggs, garlic powder, Parmesan, salt & pepper. Stir well to combine well. Cover and place the bowl in the fridge for at least three hours, longer if time allows. When ready to cook the dumplings, place flour on a saucer. Fill a pot with hot water, add salt and bring to the boil. 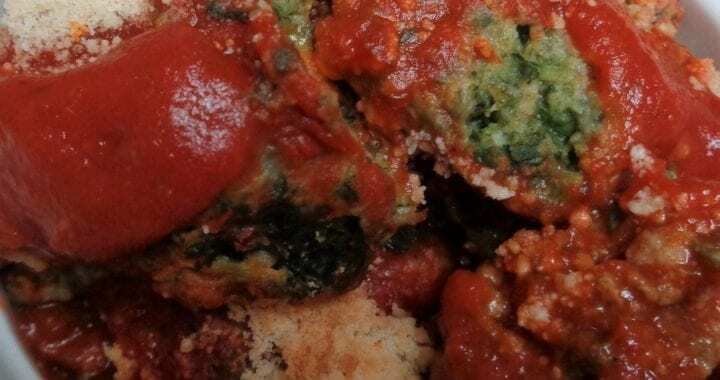 Grease a casserole dish and add three tablespoons of tomato sauce to the bottom of the dish. Spread out to help prevent sticking when the dumplings are added. 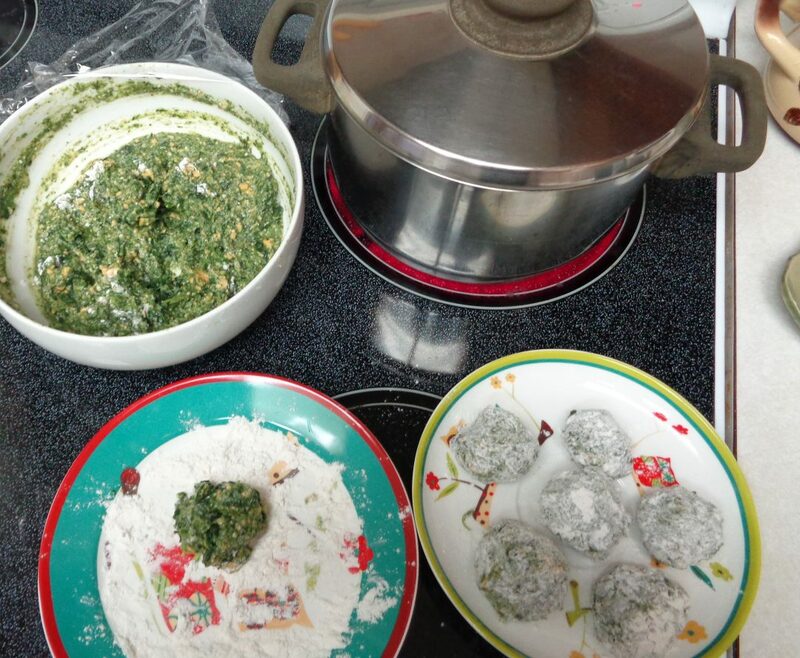 Take the mixture from the fridge and roll into small balls that can then be rolled in flour. Place the finished balls on a saucer and return to the fridge if the water is not ready. Once boiling, lower the dumplings into the water and cook until they pop up to the surface, about one minute. With a slotted spoon gently remove the dumplings, allow to drain very well and then place in the casserole dish. When a layer is full, add tomato sauce and repeat until all the spinach mixture has been cooked. 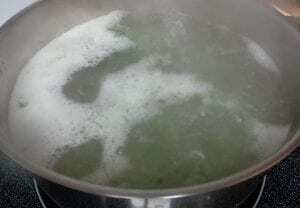 Remove the pot with the boiling water from the heat. 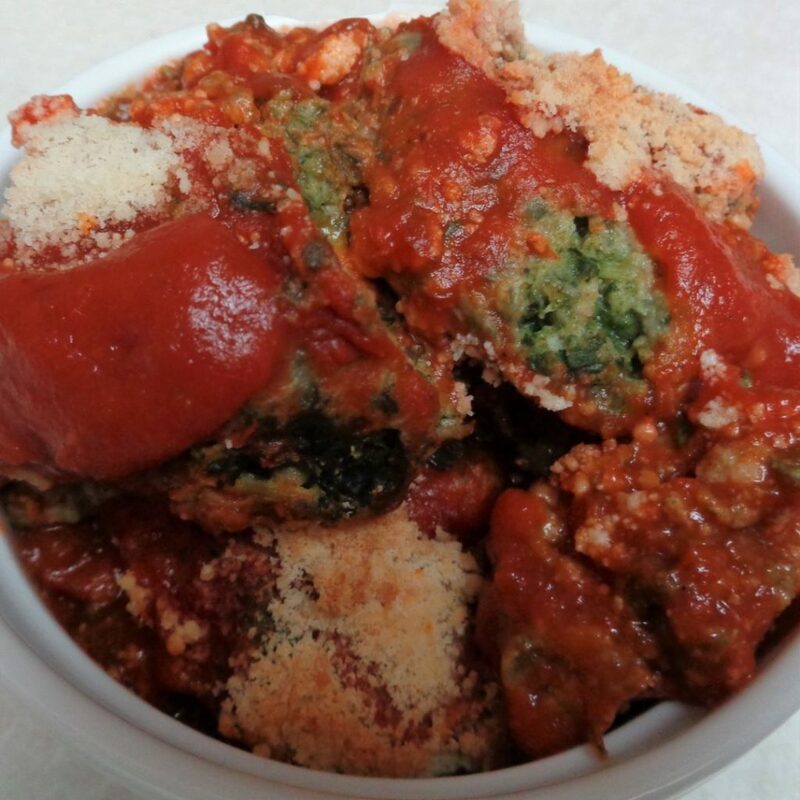 Pour any remaining tomato sauce into the casserole dish and sprinkle with the last of the Parmesan. I did tweak a couple of things. One was to add a few shakes of red pepper hot sauce to the tomato sauce. That is totally a question of personal taste. It is in the picture of ingredients. The other thing I did was use my homemade herbed salts. It was kind of a “if not now, when?” thing. Place in the oven and bake until bubbly. The cookbook suggests serving the dumplings with paste.